Back in December 2008, we were confronted with a new and rather exciting looking computer case from Cooler Master that was designed with the sole purpose of capturing gamers -- and capture gamers it did. Known as the HAF 932, the chassis quickly became a fan favorite. There was a lot to like about the Cooler Master HAF 932 with a comprehensive feature set that included quick release drive bays, rear CPU socket access, tidy cable management, and massive airflow -- not to mention a solid build quality. 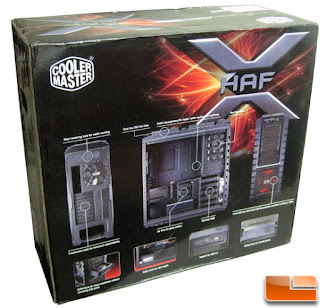 However, at a time when so-called luxury full ATX cases began to make an appearance at over $500, what really made this case special for us was its price. The HAF 932 was just $160 at the time and it can be found for only $130 these days. The HAF 932 had no major pitfalls, and now almost two years later it's still one of the best full tower cases money can buy. Given its sheer success, Cooler Master decided to cash in on the HAF brand by releasing two mid-tower versions that are more affordable. We reviewed both, and while they are decent options, they inevitably felt like cheaper, cut down versions of the original. Since then we have looked at a handful of other top notch case offerings, some specialized like the pint-sized HTPC Lian Li Mini Q, the monster big Lian Li Tyr PC-X2000F, or the uber-radical Thermaltake Level 10. But when Cooler Master announced the new HAF X as the new flagship model of its "High Air Flow" line, they had our immediate attention as we wondered how they could have improved the 932's formula. A few things were immediately obvious such as the all black paint job (including the interior) and a much bigger case window. Both are welcomed additions even if they're not entirely necessary.